All different here. I have a couple 400 ct. boxes full of duplicates. In that case, you just moved up! 1536 and counting, probably 1550 by next week. HOF bound, and I couldn't be more excited! Rickey says Rickey is excited. Closing in on 3000 Different cards, 500 Different Game Used, and 300 Different Autos, I should reach all three goals about the same time. I have a long way to go for this club. I'm guessing I'm anywhere between 500-800 with Sosa (I lost track when I lost my Beckett My Collection) - somewhere over 500 but not certain how far over. 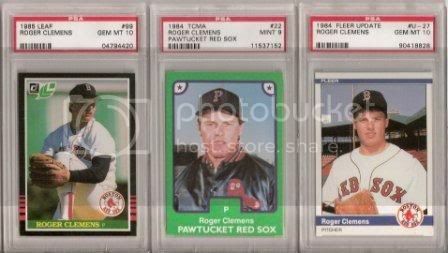 My Clemens PSA set has 1,315 cards registered with another 50+ waiting to be added. This does not include the 17 PSA graded 1/1's. I have another 400+ game used in my bucket along with 22 other 1/1s. The pacific show cards total over 1000 different cards, bucket has scans up to 1999 the set runs through 2002. I( stopped adding scans to the bucket over 6 months ago.Currently I would estimate that with all the raw cards there are over 5000 various cards in my Rocket collection. I have 3320 different Gwynns... I picked up 3 different Star Company Sets (27 cards) to put me over 3300. I have 1674 different Scott Rolen cards. I have another couple hundred that need scanned. All 1674 different Rolen cards that are scanned can be seen by clicking on my banner below. Dang it, one day, I shall join this club. I only have about 750-800 different Mattingly's. All the darn modern game used and auto's would send me way over the top.... and way in a homeless shelter. Nice goin folks, it's nice to see some amazing player collectors.